If you think you can keep a straight face in front of large sums of money, this is a game for you. 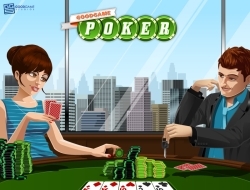 Create your very own poker player and then head down to the casino and play all the others for their money. As you play you will earn experience, allowing you to go to higher stake tables. If you complete the tutorial, you will also get a large amount of poker chips allowing you to lose a few matches without feeling it too much. You will be given two cards and after all the bets, the dealer will turn a new set of three, followed by another set of betting and so on, until there are five new cards on the table. Try to figure out if you have a better hand then your opponents and start collecting chips. Goodgame Poker 10.00 between 0 and 10 based on 1 votes.